The International Rollei Club is since the early years of the internet the World's leading information resource for Historic and current Rollei and Rolleiflex cameras and related photograpic equipment. 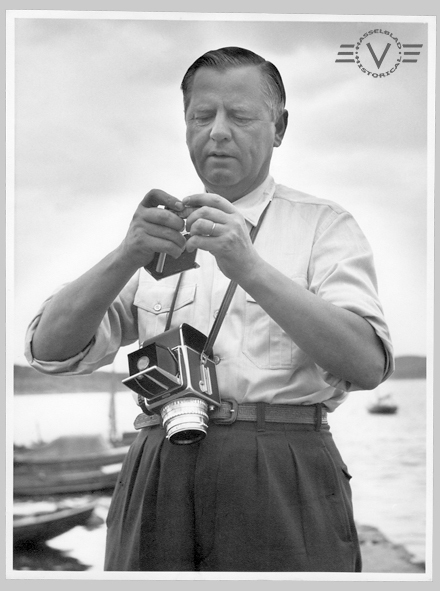 Victor Hasselblad met that other pioneer of medium format photography, Reinhold Heidecke (who with Paul Franke was responsible for that other epoch-making camera: the Rolleiflex twin lens reflex) at the 1954 Photokina in Cologne. Victor Hasselblad invited Heidecke to come over to Sweden, and the following year Heidecke indeed did. 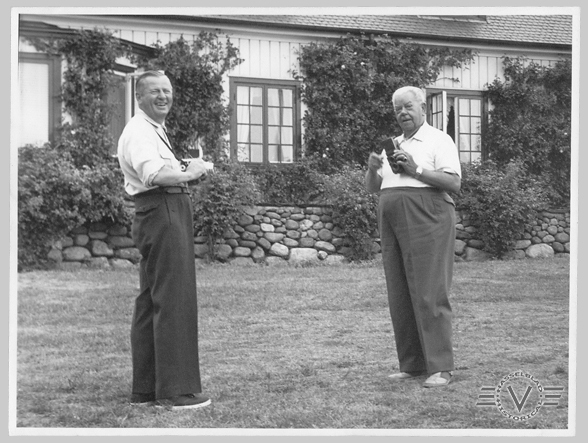 After visiting the Hasselblad factory in Göteborg, Victor Hasselblad entertained his guest at Råö. 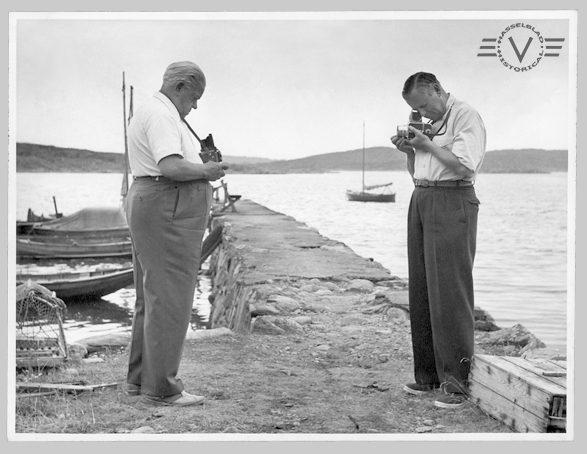 Besides discussing all sorts of technical matters camera pioneers like to discuss, they arranged a photo shoot. The participants, as well as the subject matter, were the two camera makers themselves. 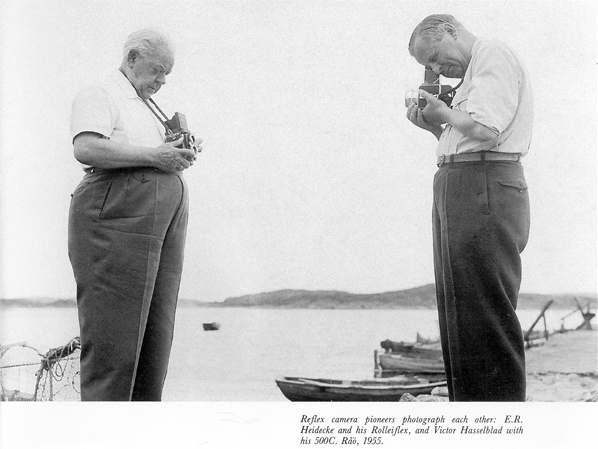 The picture below, showing Hasselblad and Heidecke trying out their cameras on each other, is published in Evald Karlsten's book "Hasselblad - I am the camera" (page 65). 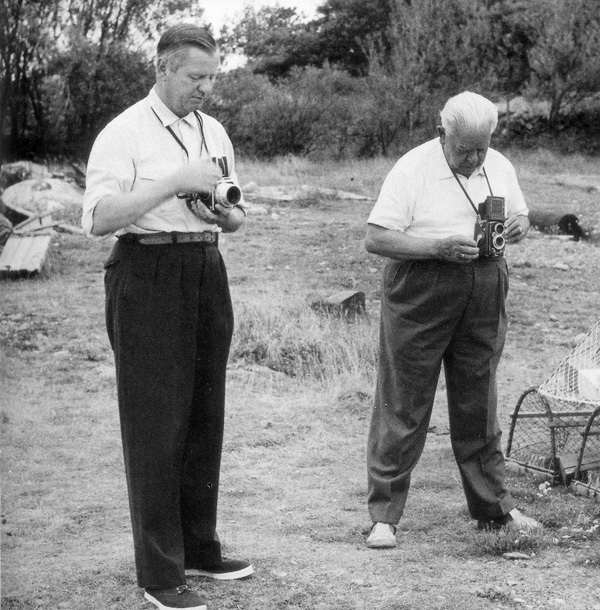 The caption mentions that Hasselblad is using a 500 C. In fact, the camera is an 1000 F.
In Sören Gunnarsson's "short biography" (page 119), another picture of the occasion is published (below), showing that the gentlemen took pictures of other subject matter as well, aiming their cameras at the view along the jetty and across the water from Råö. 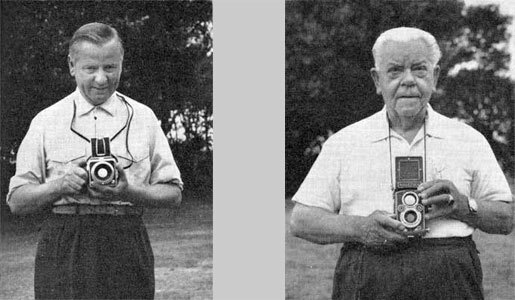 Reinhold Heidecke (left) and Victor Hasselblad take each other's picture. Heidecke and Hasselblad are said not to have considered each other as competition, but rather as fellow engineers, sharing a common passion. The fact that the two gentlemen embarked on a Hasselblad vs Rollei photo shoot - though just as a bit of fun - might however already begin to suggest different. 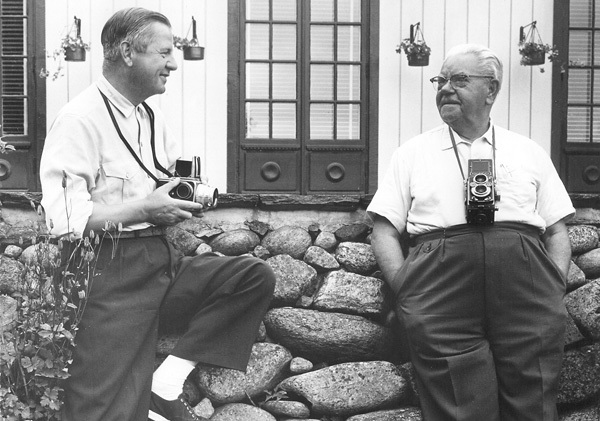 Nevertheless, Hasselblad and Heidecke remained good friends, and are even said to have agreed that Hasselblad would never make a twin lens reflex medium format camera, nor Rollei a single lens reflex medium format camera. And the results? 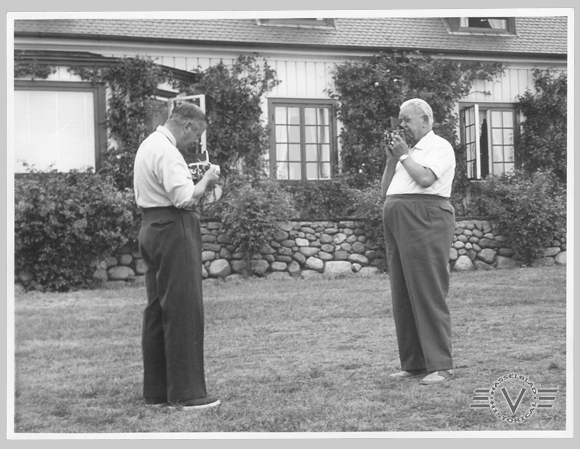 The pictures below probably were not taken by either Victor Hasselblad or Reinhold Heidecke, but by the same photographer(s) that documented the shoot out at Råö. If you have, or know of, more pictures of this ocassion that we could add to this little 'album', we would very much like to hear from you! Copyright 2008, 2011 - Q.G. de Bakker. All rights reserved.